Look years younger with dermal fillers Juvederm® and Restylane®! As we age our skin becomes thinner, loses fat, and begins to wrinkle. Facial aging is a result of genetics and natural aging, as well as sun exposure, smoking, pollution and sleeping positions. Great skincare can make a huge difference in the appearance of your skin but age, muscle movement, fat loss, gravity, and sun damage eventually win over. You can help maintain a youthful appearance with dermal fillers! Dermal fillers can help correct the signs of aging that are beyond what skincare products can do. With minimally invasive, clinically proven, natural-looking results to help maintain a more youthful appearance. Treatment appointments last less than an hour and begin to work almost immediately by adding volume to smooth away wrinkles. What are dermal facial fillers? Dermal fillers are either made of naturally-derived or synthetic material that is directly injected into skin with the purpose of plumping that area to the point where the wrinkle, depression, or fold is gone. What’s the difference between Juvederm® & Restylane®? Restylane® products are transparent hyaluronic acids, which are sugars naturally found in the skin that help provide hydration, fullness and elasticity. Hyaluronic acid diminishes as we age, causing skin to lose volume, while increasing the chances for wrinkles and folds to appear. The Restylane line of products is designed to act like your body’s own naturally produced hyaluronic acid. Restylane’s NASHA® technology allows a unique particle size for each Restylane product, which means they offer tailored treatments for individual, natural-looking results. Juvederm® dermal fillers are made from hyaluronic acid (HA). What’s interesting about HA is that it’s a natural substance in the skin that delivers nutrients, helps the skin retain moisture and softness, and adds volume. Each product in the Juvederm collection of fillers is made from a modified form of HA. Juvederm XC® has unique HYLACROSS technology, which gives Juvederm XC its special smooth-gel consistency. You’ll get a smooth, natural look and feel creating a more youthful appearance. Doctor Kowynia will help you choose which product is right for you and customize your treatment to give you the natural-looking results you want. Are there risks with Facial Fillers? As with all cosmetic procedures there are some risks involved. With the use of fillers some patients might experience an allergic reaction or there may be some slight swelling and redness to the area being treated. These instances are not the norm but usually resolve very quickly. Although both procedures involve injections, Botox is mostly injected around the forehead and wrinkles around the eyes (crow’s feet) to stop muscle movement that results in wrinkles. 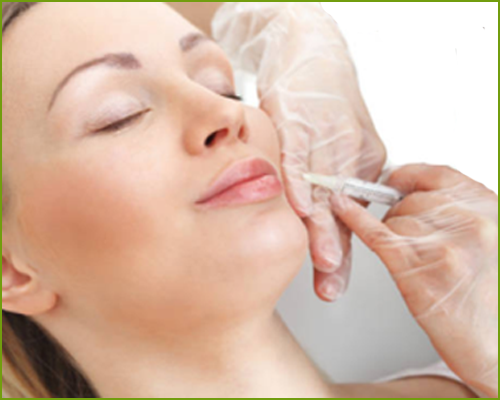 Fillers are used to plump the skin and create a smoothing effect. Many people elect to get both Botox and dermal fillers. The combination can produce a remarkably younger looking appearance.